The BSB A60 Multiblade Marine Fire Damper is designed for use in marine applications to protect the integrity of fire rated bulkheads and decks. Each A60 damper is controlled by an electrical failsafe spring return actuator combined with a thermoelectric tripping device (thermal fuse) and volt free contacts for remote status indication. The A60 damper can be used where the maximum system pressure is 2000 Pa and duct velocities do not exceed 20 m/s. The A60 Marine Fire Damper has been tested in accordance with EN1751 with case leakage conforming to classes A, B and C and closed blade leakage to class B. 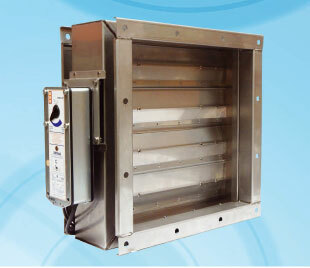 The A-60 Marine Fire Damper is suitable for both vertical and horizontal applications, with airflow in either direction. MED (Marine Equipment Directive 2014/90/EU) certified for A60 fire performance. Conforms to Commission Implementing Regulation (EU) 2018/773.